Earlier today I was looking up my favorite hamburger joint on Google Maps and thinking “I wish Google Maps had an aerial view.” Then I remembered, Google Maps Labs has an aerial view feature! Not only that, we need to talk about several other groovy features! 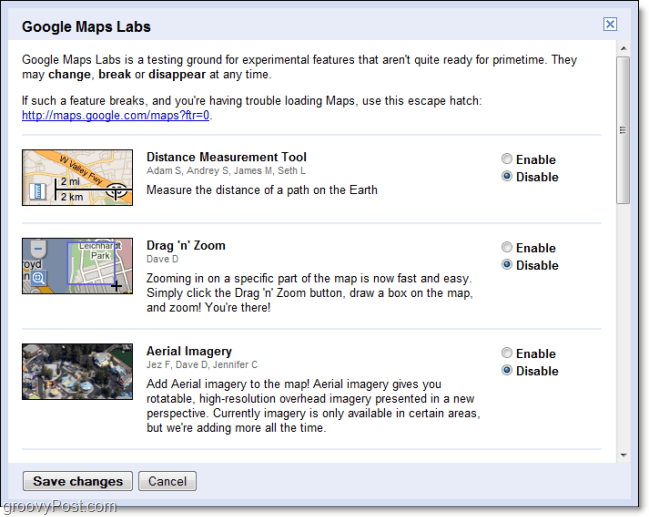 When you visit maps.google.com, you might have already noticed the New lab icon that is up in the top-right of the browser. For those that haven’t, here it is! Rather than taking you to a different page or tab like Gmail lab does, the Google Maps Labs opens in its own in-page window. It’s a pop-up, but it isn’t a pop-up. Anyhow, here you can enable many of the groovy features that Labs has to offer. We’ll look at the list of these below. Some of the new Google Maps features that are really groovy. When you’re finished enabling or disabling Labs, Google will remind you with a pop-up if you forget to save changes. If something with Labs goes wrong, you can always disable all of the features by following the no labs link: http://maps.google.com/maps?ftr=0. Have fun!